What could be better than a movie about an adorable yorkie, New York City, and a girl with fabulous clothes? Nothing if you ask me! Walt Disney Studios Home Entertainment will be proudly unveiling Sharpay’s Fabulous Adventure, an all-new movie on Blu-ray™ and DVD staring Ashley Tisdale reprising her role as Disney Channel’s global sensation “High School Musical” drama queen character Sharpay Evans. A full three minute sneak peek of the movie is now widely available for fans of all ages to get a glimpse of this hilarious fish out water tale about a small town Diva and her dog’s adventures in New York City at http://www.youtube.com/disneymovies. From the original producers of High School Musical and the director of The Tooth Fairy, Sharpay’s Fabulous Adventure is a witty comedy about pursuing your life-long dreams and believing in yourself. The films catchy tunes, Sharpay’s lavishly glittery “pink” outfits, and the adorable featured male co-stars – Austin Butler (“Life Unexpected,” “Ruby and the Rockits” and “Zoey 101”) and Bradley Steven Perry (“Good Luck Charlie”) – will be sure to keep viewers fully entertained and laughing throughout. -BLOOPERS (on Blu-ray & DVD) – Ashley Tisdale and the cast cut up on set. -AUSTIN CAM (on Blu-ray & DVD) – Actor Austin Butler, who plays student filmmaker Petyon, not only shoots scenes needed for the movie, but takes his camera behind the scenes to see how Ashley Tisdale has fun between takes. -THE EVOLUTION OF SHARPAY (on Blu-ray only) – Ashley Tisdale traces the development of her bigger-than-life character from the High School Musical movies through her current movie. Disney Movie Rewards currently has a $8 off coupon for the Sharpay's Fabulous Adventure Combo Pack! This movie is adorable! It's perfect for any girl who loves musicals and the big city. You'll love all of the unpredictable moments too. 1. I will be picking ONE (1) winner for this contest. 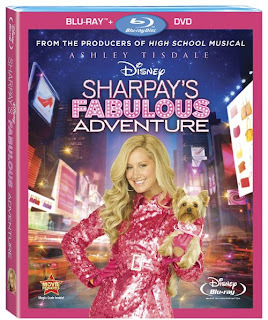 One winner will win Sharpay's Fabulous Adventure on BluRay/DVD combo. Winner will be chosen on April 30, 2011 at 10 pm and then will be emailed. My girls love Sharpay and the entire High School musical series. They'd love this. My niece loves anything high school musical. She would be thrilled to see this! ohmygosh! i've been a fan of the High School Musical series ever since i saw the trailer! I would really love to win this DVD combo. gaahh. Fun for someone with a little princess in their lives! My daughter just watched all the High School Musical and would love to see this! I would love to win this because my daughter loved all the High School Musical movies. I am sure this movie would be no different. Like Sharpay, she dreams of being a famous singer/sctress/dancer on Broadway so this movie is sort of tailor-made for her. She would absolutely love it. Id love this because my daughter wants it. My daughter would love it, I would too! I'd like to win the Sharpay DVD for my granddaughters who love everything High School Musical. I'd like to win it to watch with a friend's daughters. I would like to win this movie because my daughter would really enjoy it. I would love this movie for my daughter! My daughter loves Sharpay! She would be so excited if I won this for her!! I'd love to win this for my niece because she'd really enjoy watching it. I would like to win this because my daughter would love it. My girls would love this movie. I'd love to win because I have a heck of a time finding movies to watch with my niece when she visits, especially movies we'll both enjoy, and we both loved "High School Musical" and got a kick out of the conniving, hilarious Sharpay. Thanks! I'd love to win because my daughter wants to watch this movie. I would love to see this movie, it looks very good from whatI hav sen in the previews. I'd like to win because I have a tween who would enjoy watching it.